The local American Association of University Women is inviting the community to help boost budding MTSU educators’ new schoolroom wardrobes by donating clean, gently used clothing Thursday, Feb. 7. AAUW’s Murfreesboro branch will collect donations for MTSU’s Clothing Our Educators Boutique at the group’s meeting in the Ingram Building, 2269 Middle Tennessee Blvd., from 5:30 to 7 p.m. Feb. 7. Clothing Our Educators took its inspiration from Raiders’ Closet, the free professional clothing service established by MTSU marketing professor Virginia Hemby. 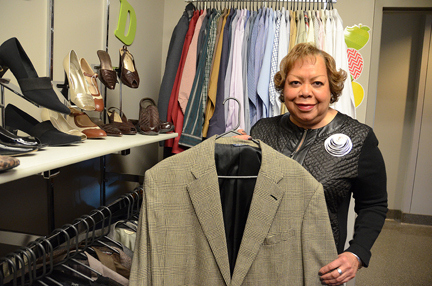 Raiders’ Closet, located in Room 327 of the Keathley University Center, provides students with good pre-owned business clothing for job interviews and in office settings. June Adams, an adviser and graduation analyst in the College of Education, launched her free teacher-specific clothing service in spring 2016. The Clothing Our Educators Boutique, located off Dean Lana Seivers’ second-floor office suite in the College of Education Building, needs gently used clothing appropriate for students ages 20 to 30. Both men’s and women’s clothing is needed, including slacks, skirts, blouses, dress shirts, blazers, ties, sweaters, jackets, handbags, jewelry and accessories. AAUW members also will vote Thursday on the nominating committee for 2019-21 branch officers and hear updates on new programs and opportunities to advance the causes of women in the university community. The meeting is free and open to the public, but only branch members may cast votes. For more information about the organization, contact Murfreesboro President Dia Cirillo at 773-677-4238 or president@AAUW-Murfreesboro.org. For more information about MTSU’s Clothing Our Educators Boutique, email Adams at june.adams@mtsu.edu or visit www.mtsu.edu/studentsuccess/crisis-aid.php.